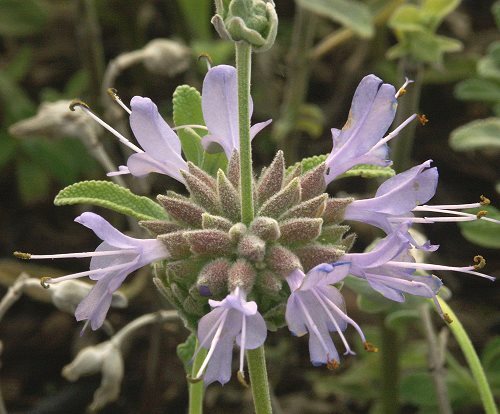 Gracias Sage is a slowly spreading shrub that gets about two feet tall. It puts on an amazing show of flowers in early spring. Drought resistant and heat tolerant, Gracias Sage is the perfect choice for that dry spot in the garden. Even though Cleveland Sage is one of its parents, Gracias Sage does not get as tall or as woody as Cleveland Sage and is a better choice for smaller gardens. The fifteen year old patch of Gracias below has been left unpruned so it has spread to almost thirty feet across. It provides a spectacular display every spring. The yellow plant peaking above it is a young Lemon Cypress. The taller plant to the right of the picture is a variegated butterfly bush called Harlequin.